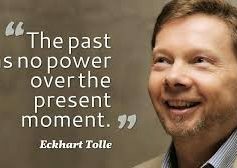 “Focus your attention on the Now and tell me what problem you have at this moment"
Eckhart talks about the connection between our thoughts and emotions– emotions tend to reflect the activity of the mind. Often, we carry deep-seated emotions for years — the pain body — that can generate certain types of thinking. If we are not aware of the deeper dimension with ourselves, we will react habitually, like a wind up toy reacting to whatever pushes our buttons.